I knew that Thursday night drinking was a bad idea. I'm feeling a bit worse for wear this morning, but luckily didn't sleep through my alarm. I had the feeling that today might be a baron day when it comes to Gunners news, but there is enough about for me to blog about. We'll start with the chairman who has been speaking to his favourite newspaper about our most in form player. As we all know, Robin van Persie has entered what I like to call the Arsenal contract amber zone. He's within 18 months of his contract expiring and yet to sit down with the club to discuss a new one. His agent is Darren Dein, who represents his good friend, holiday buddy and one time Arsenal team mate Cesc Fabregas and is best known for negotiating moves away from the Grove rather than prolonging them. An agent only does what his client asks for him to do, so it's ominous that van Persie has signed up Dein to represent him. Alex Song has also recently become one of the clients of Arsenal's former vice-chairman's son. The club are desperate to sit down with Robin and thrash out an extension. But he's made it clear that he's not ready to do that. Arsene Wenger has been constantly asked at his press conferences about the progress on agreeing a new deal with the Captain, but has now pulled down the shutters and is refusing to entertain such questions. And now the chairman has been asked about the deal and to clarify the situation. 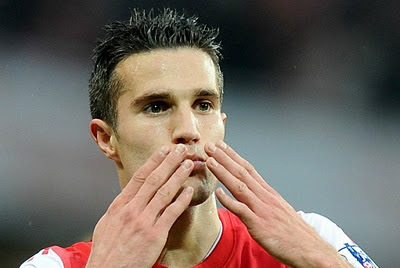 "He [RVP] doesn’t want to talk about it at the moment and we are not troubling him. "I think we will approach him near the end of the season. "But we obviously hope that he will sign a new contract – I don’t see why he should not. I can’t believe he is unhappy with us." I don't think Robin is unhappy with us either but you can see that he would be concerned with the situation. He's seen Fabregas leave and then Samir Nasri follow the Spaniard out of the door. Then he's seen the manager go on a Christmas Eve style shopping spree trying to bring in as many good players as he can until the transfer window closes. And are the players Wenger's brought in as good as the players he's allowed to leave? In the case of anyone trying to replace Fabregas, it's near on impossible. As for Nasri, Gervinho has proved to be a decent signing so far. But he's off to the African Cup of Nations in January and where will we be then? I think it will come down to three things if we see Robin re-sign. (A) Where we finish in the league this season; (B) Who we sign in January or at the end of this season; (C) How much more money we're willing to pay him. I can't see this situation being resolved quickly, so we've got to put it to the back of our minds and hope that we finish in the top four. That in my opinion will go a long way to ensuring Robin isn't a one season captain at the club. In other news, I can confirm that Alex Oxlade Chamberlain is human like the rest of us. Much to the disappointment of all England under-21 fans, the 18-year-old didn't get on the score sheet last night as Stuart Pearce's side thumped their Iceland counter parts 5-0. And by the only account I've read about the game, the Arsenal youngster only got one assist. What is the world coming to? In all seriousness, I think it's good that Arsene Wenger has only given Oxlade Chamberlain a few first team run outs so far. He's done well in them and is showing his improvement. But he is still a very young player and we shouldn't be hoping an 18-year-old is going to solve all our problems. I think he'll be a fantastic talent for us. He's got his feet on the ground, his family around him offering him good advice and the desire to improve. And in Arsene Wenger, he's got one of the best managers in the world proven in developing young players to their full potential, if they give 100 per cent. Elsewhere the official site sets out why midfielder Brek Shea has joined us "for experience". I don't buy that it's not a trial. Arsenal aren't a charity. We don't offer our training facilities to just any "exciting" and "promising" talents in the MLS. Wenger will be running the rule over the FC Dallas player with a view to signing him. I know nothing about him other than he wears an Alice Band to keep his hear back. Didn't Robert Pires wear one of those? And finally some transfer speculation. The Daily Mail says we're scouting Rennes midfielder Tongo Hamed Doumbia. The 22-year-old is 6ft 3in, can play in the centre or on the right and could be available for around £8million. More interesting is the fact Thierry Henry has recommended to Arsene Wenger (this is according to the Daily Mail) his New York Red Bulls' team mate Tim Ream. The 24-year-old USA defender has told the media that Henry has alerted Wenger that he's one to watch. And for some extra reading this morning, take a look at the second of our series of posts about Arsenal's summer signings and how they're progressing. Joss Bennett looks at Yossi Benayoun's first couple of months at the club.